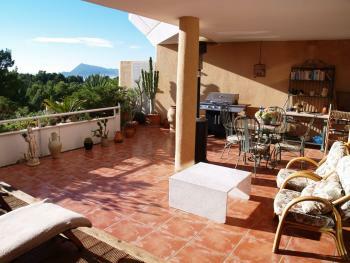 Nice completely reformed apartement on the toplevel of a small building in the typical spanish village of Altea la Vieja. The apartment has a large living room with open kitchen and utility room, beglazed terrace with spectacular views overlooking the mountains and the sea. Two bedrooms and one bathroom with shower. Air conditioning in the main bedroom and pre-installation in the other rooms. Communal swimming pool in a tropical garden. Private garage in the underground parking space.